For Ev’s birthday we served chicken and waffles (which my friend pointed out meant we basically served pound cake two ways). 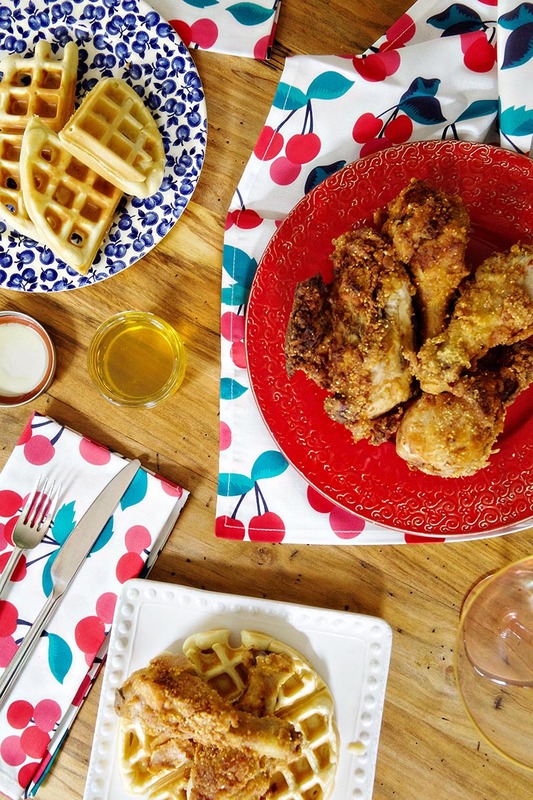 The fried chicken recipe is from my most recent cookbook, The Southern Cast Iron Cookbook and the waffle recipe is from my first, The American Cookbook. We topped the chicken & waffles with honey harvested by my friend and neighbor, and served it with prosecco, because we were celebrating. It combined some of Everett’s favorite food groups (breakfast foods and food you eat with your hands), and made for a pretty sweet birthday dinner. In a large bowl mix together all ingredients for marinade. Add chicken to bowl, cover, and refrigerate overnight. On a counter accessible to your stove top line up three bowls. In the first bowl combine half of the flour and spices. In the second bowl whisk together eggs and apple cider vinegar. In the third bowl combine remaining flour, spices, and bread crumbs. Heat 1” oil to 375F in a large, heavy bottom skillet. Add chicken to the hot oil and fry. 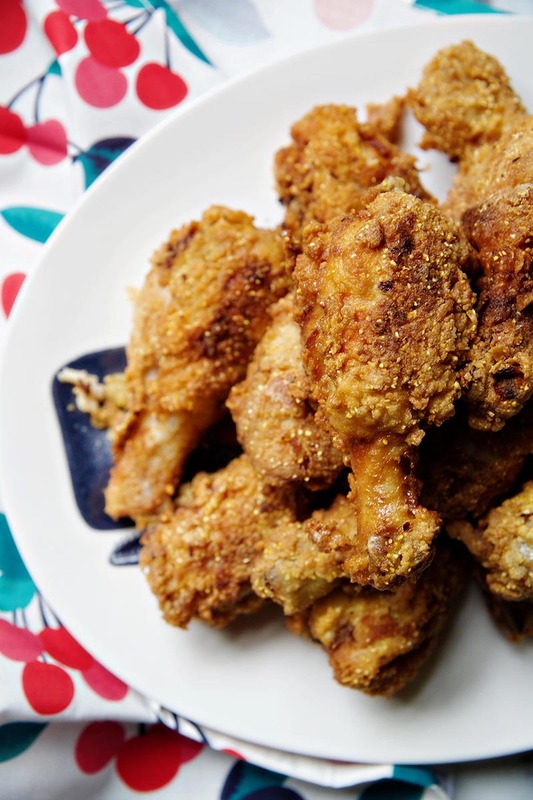 White meat pieces should be fried 4-5 minutes/side and dark meat pieces should be friend 5-7 minutes/side. Keep warm on a rack in a 200F oven. While your chicken is keeping warm, make your waffles. Mix together flour, baking powder, sugar, and cornmeal in a large bowl. Make a well in the center and pour in the milk, butter, vanilla extract, and egg yolks. Whisk together. Preheat the waffle iron. In a separate bowl whisk the eggs until soft peaks form. Fold into batter. Cook the waffles to the specifications of your waffle iron. 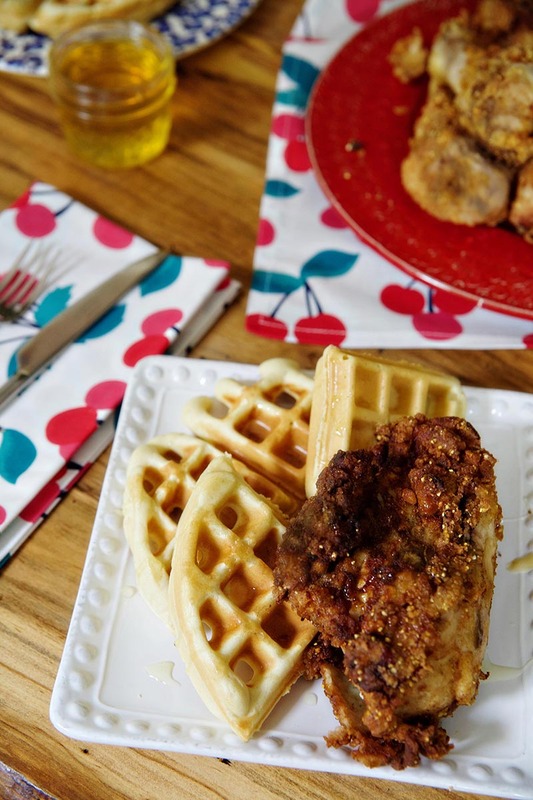 Serve chicken and waffles together, warm, and with honey or syrup. for the chicken, simply substitute flour for a 1:1 gf blend (I used King Arthur). for the waffles, substitute flour for a 1:1 gf blend and add 1/3 cup milk.